Closed Hands is an experimental game work which will allow the user to explore the stories of a myriad of characters who have been impacted by a terror attack. This work is the next in a series of games created by the artist Dan Hett, who tragically lost his brother in the Manchester terror attack in 2017, each of which conceptually engages with themes of grief and the experience of being at the centre of public interest in the aftermath of the attack. These works include ‘c ya laterrrr’, ‘Sorry to Bother You’, and ‘The Loss Levels’. The work is currently In development. The second iteration of Naho Matsuda’s artwork EVERY THING EVERY TIME was exhibited at the Great Exhibition of the North 2018. A three-month celebration of the North of England’s artists, designers and inventors, the Exhibition will feature a huge number of artworks, performances, experiences and new commissions. Naho’s artwork interacted with data from across the city provided by sensors from the Urban Observatory at Newcastle University and the buildings across the city centre. 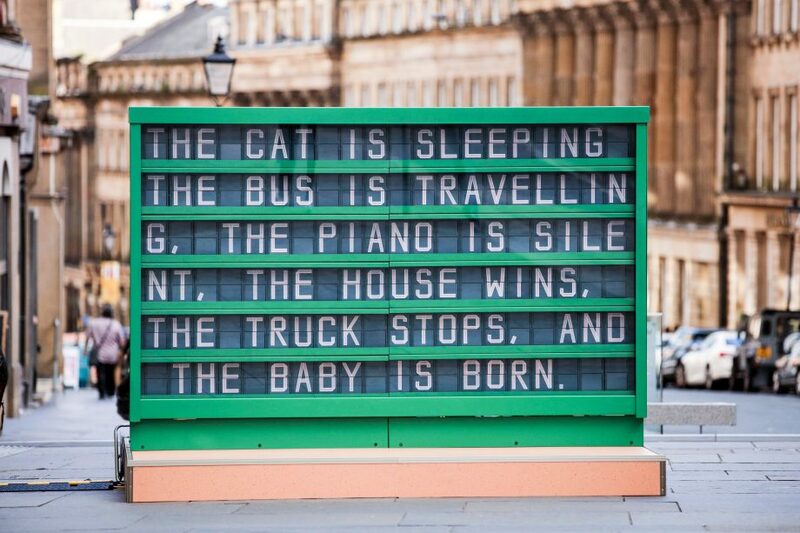 As Newcastle and Gateshead citizens passed through the city a poem is generated about their interactions in realtime, made anonymous and then displayed on a mechanical display outside the Theatre Royal in the city centre of Newcastle. EVERY THING EVERY TIME will be shown outside the Theatre Royal, Grey Street, Newcastle upon Tyne from June 22nd to September 9th. Take a listen to the EVERY THING EVERY TIME podcast talks in more detail about the city of Newcastle and the inspiration behind the project. The programmes vision was to support artists to develop art practice in technology innovation, and to create new opportunities in how artists work and where and who art is commissioned by. I came into the role in the programmes second year, developing a bespoke development programme for each of the artists and leveraging commissions and opportunities with partners such as CityVerve, STARTS European Commission and SHIFT Cheshire east. Artists: Kasia Molga, Dan Hett, Ling Tan, Helen Knowles, Naho Matsuda, Chomko & Rosier, Peter J Evans. SUPERGESTURES by Ling Tan. A participatory art project co-created with the people of Manchester. The second artwork commissioned by CityVerve, Manchester’s IoT Smart City demonstrator. 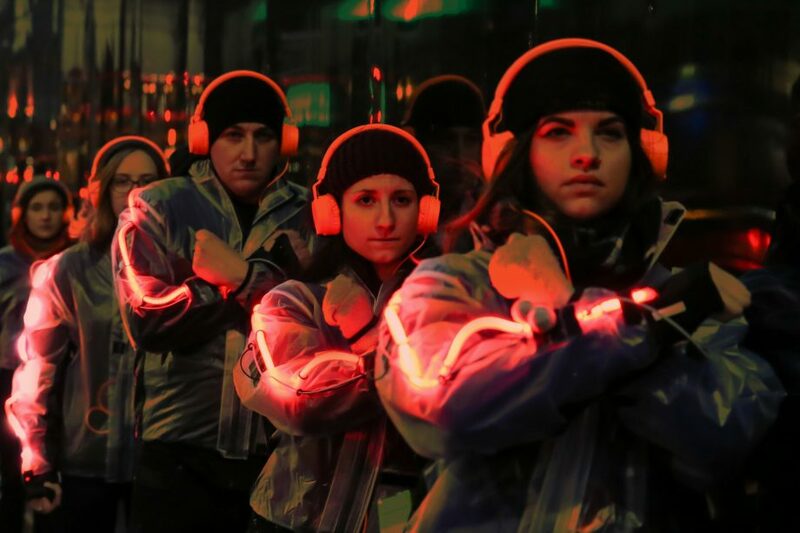 Participants will use wearable technology to create a language of body gestures which will express both their relationship with the city and their vision of a future smart city. The finale of SUPERGESTURES took place at Future Sessions in March 2018.
every thing every time by Naho Matsuda. What stories can be uncovered from a city? The first commission for CityVerve. The work used various data streams – from sensors measuring weather, traffic and travel – to create an ephemeral, poetic narrative that was displayed across Manchester. The commission brief was shaped by community forums, and responds to themes and technologies in the CityVerve project. Art and science exhibition Quantum Entanglement, featuring new commissions and award-winning works from UK and Russian artists, as part of FutureEverything Moscow. This exhibition presented a series of works by artists exploring this idea and the theory of quantum entanglement. LABORATORIA Art & Science Space, founded in 2008, is the first nonprofit exhibition and research centre in Russia focused on constructing platforms of interdisciplinary interaction between contemporary art and science. One of the main methods of Laboratoria is the integration of artists in scientific research laboratories and institutes, and vice versa, placement of scientists into the contemporary art environment. Singapore citizens were invited to a five day workshop to collaborate with leading designers to share ideas, affect policy, co-design prototypes and create artistic responses to issues surrounding a ‘Smart Nation’. The final prototypes were exhibited at a special ArtScience Sunday Showcase event at the ArtScience museum in Singapore engaging over 500 visitors. The exhibition was a part of The Festival of Tech for FutureEverything Singapore.